Paint: Benjamin Moore Sunlit Coral. Sofa: Purchased at online auction. Lamp: Elio Martinelli. Side tables: Ferm Living; large, similar; small. Coffee table: Pink marble top bought at auction, base: Crate and Barrel. How did you decide on pink paint? Hollister: When we first moved in, we painted all the walls black, then baby blue, then white. The black wasn’t depressing, though; it was like living in a Dutch painting, where all the art and even our faces popped off the wall. Porter: We talked about going pink for years, but since the walls are so high, it’s always such an effort to paint. It mimics our roles in life — Hollister will start painting and be really excited about this great project, and then she’ll get bored, and I’ll have to finish it. It was the same with Christmas cookies when we were little. Hollister would bake one tray of beautiful cookies — and we were left with mounds of dough afterward. Our dad was like, there are 500 more trays to do. Hollister: But we did it! This pink is warm and makes your skin glow-y. It’s nice to feel pretty against a wall. Gold sconces: Hans-Agne Jakobsson, found at auction. Painting: by Hollister. Pendant lamp: vintage, similar. Pillows: Ralo Tibetan Rugs, gold and white dots; blue mosaic; tiger stripes. Rug: found at auction, similar. Tell us about this huge sofa! Hollister: When people come over, they talk about the sofa right away. We got it at an online auction for $600. LiveAuctioneers brings together tons of regional auction houses, not just Sotheby’s and Christie’s, which no one can afford. You can do all the auctions online — even from your phone. Backgammon table: Tomasso Barbi. Copper lamp: Tom Dixon. Flowers: Caribbean Cuts; Dutch Flower Line; CFD. How do you spend a typical evening? Porter: We watch a lot of TV. Hollister: It’s the golden age of TV. Porter: Our work is super stressful, and we’re always on an adrenaline high. Hollister: When we’re exhausted, we’ll watch Outlander, Homeland, SVU or Criminal Minds on a projector that we hide in an armoire. Porter: For some reason, procedural shows calm us down. It’s odd to say but with a murder you know what’s going to happen. Wardrobes: vintage Henredon, from Les Indiennes Outlet. Mirror: CB2 (painted black). Mushroom lamp: France & Son, similar. Rug: found at auction, similar. You run an apartment staging company. What exactly does that mean? Hollister: We decorate empty houses really quickly to help the sellers maximize the value for a sale. We want to help buyers picture the space as their own the moment they step inside. We like to say, hey, even the most stunning actresses put on the best dresses for the Oscars. It always helps to dress up an apartment a bit for its big day, too. Porter: It’s fast work. We’re turning these apartments around in two to three days, including all the design, moving and logistics. Hollister: We always mix Ikea furniture with beautiful antiques. And every time someone has wanted to buy stuff from us, it’s the Ikea pieces! How did you get into staging? Hollister: We had many other jobs first. I worked in business journalism and then medical device PR. Porter was an events photographer, assistant and real estate agent. Porter: Then we got a vintage Danish modern couch, and I was like, we can start a staging business! I think being blind and naive about it was actually to our advantage. Chairs: vintage Marcel Breuer for Thonet. Vases: West Elm. How do you choose indoor plants? Porter: Any greenery will make such a difference. When we’re staging, a space never feels done until you bring in the plants. Then you walk in and go, ahhh, I feel at home. Hollister: A funny thing, though, is that for staging, the real estate agents don’t have time to water our plants, so we have to use fakes. But silk flowers have gotten good. The orchids on our table are actually fake! Where did you find this gorgeous table? Hollister: It’s just an Ikea butcher block! We got lucite legs made for it, which was more of a splurge than we expected. We could have definitely gone with thinner ones. Hollister: Then I painted the tabletop green and drew all the lines over it. It takes forever, but it’s not something that involves tons of talent. You just wet your brush and smear larger sections. Finally, you draw the bajillion little lines in black and white. Wow! What about the wolves? Hollister: I painted the lone wolf. It’s a copy of the artist Walton Ford. Then my friend Max Toth, who is a real artist with a gallery, came over and did the fighting wolves. Porter: We can never ever paint over it. You guys throw such epic parties. Any must-dos? Hollister: My best advice is to send out an email beforehand about the cast of characters. You only need to put one sentence — this woman is a cartoonist, this guy loves bocce. That way, everyone comes in knowing everybody else. Porter: This will date us, but it was Hollister’s 25th birthday, and she had invited five boys from Friendster. 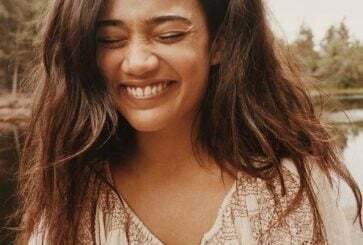 Hollister: I thought, it will take a long time to go on dates with all of them, so I’ll just invite them all to my party! Of course, when that happens, you end up with no one. I carried an hors d’oeuvres tray all night, while everyone else was making out. Everyone made out but Hollister. Green paint: Benjamin Moore. 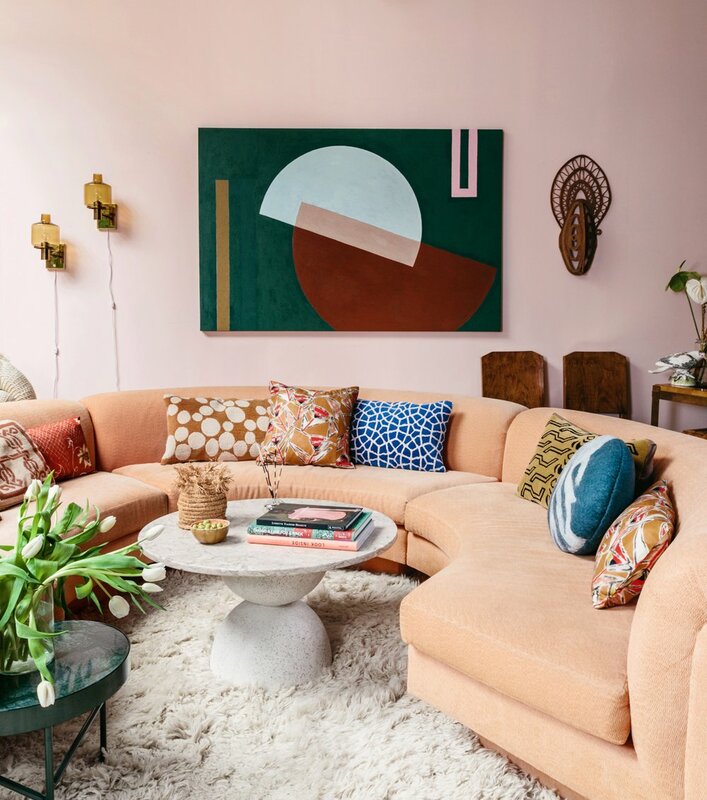 Pillows: Hawkins New York. Gold blanket: West Elm, similar. Reading sconces: France&Son. I love how you make your own artwork. Do you have tips for beginners? Hollister: Truly, don’t be afraid to try it out. You can do squares, circles on a canvas… I’m not a painter, never was, but you can mess around. Porter: People can get so nervous about art. But look at what’s in museums! I love abstract expressionism, and I know those artists were the first to do it, etc., but it’s random! You’re not trying to sell a museum piece anyway, you just need something nice for your house. You could frame linen and it will look pretty. Desk: found in hallway. Pink table lamp: Beam Brooklyn. Chairs: vintage Marcel Breuer for Thonet. Wall sconces: Roanoak. How would you define a comfy bedroom? Hollister: We’re wildly low key with bedroom needs. In my old studio apartment, I had a twin bed until I was 25, and Porter spent the summers sleeping on my LOVE SEAT. She’s 5’11”. Linen duvet covers are great, though. The subtle scratchiness that eventually gives way to complete softness is wonderful. We get ours from Hawkins New York and SeaMe Linen. You guys found an amazing sofa, but do you have advice for people starting from scratch? Hollister: Buy one statement piece. Usually, that’s a cool chair. Sofas are often practical and comfortable, but if you put one cool chair next to your boring sofa, it will all look amazing. Porter: Ikea also makes nice sofas. They don’t steam the sofas in the showroom, but if you steam them, they look really good. Be honest: Do you ever get on each other’s nerves? Porter: Honestly, we’re usually in sync. It is pretty amazing that we work together, live together, hang out together and have a lot of the same friends. Hollister: We’ll even independently order the same food at restaurants. 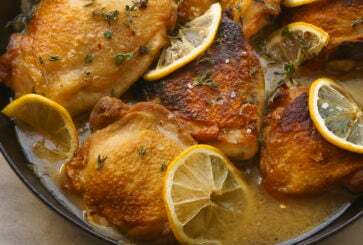 Hollister: I’ll be like, I’ll have the chicken and brussels sprouts. Porter: And I’ll say the same thing. You’ve mentioned before that you were really inspired by your mom. What was she like? Hollister: Our mom was just the coolest. 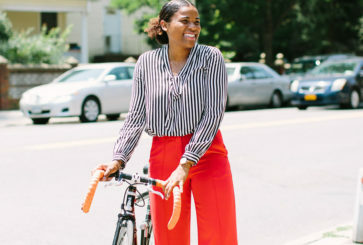 She grew up in Nebraska and dreamed of working for a fashion magazine. After college, she landed a job as an editor at Mademoiselle. She met our dad in New York and they ended up moving back to the midwest. She pushed us to be strong women who didn’t conform. She died from colon cancer in 2002 when Porter was 19 and I was 23. She’d been sick for three years, but it was completely devastating. We still work to make her proud and think she’d be ecstatic that we’ve started our own company doing things she would’ve also loved. How long do you think you’ll live here? Hollister: Until they kick us out. Thank you so much, Hollister and Porter! P.S. More house tours, including a New Hampshire cottage and my sister’s apartment makeover. 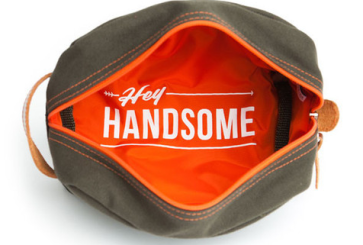 Plus, Hollister’s beauty uniform! This is the most interesting home tour I’ve ever looked at, and I found the interview portion to be just as interesting! The originality is inspiring! As someone who doesn’t have an ounce of cool in her body, can I just say how amazing these two women are, wow!! Even down to their names….oh to be that stylish….love their home. This is just the most stunning and unique house ever! I’d definitely want to go to their parties — you can just tell they’re going to be a great time. definitely my favourite house tour so far – amazing! they seem like such cool ladies. and i agree, week of outfits next!! Great post! Any chance you can share Hollister’s lipstick color here? Maybe it’s one of the ones listed in her beauty uniform too, but I’d love to confirm! Anyone know why you’d steam a sofa? I want to know how they got their awesome and unique names – so interesting but still classic! I was just thinking about them and your blog the other day! 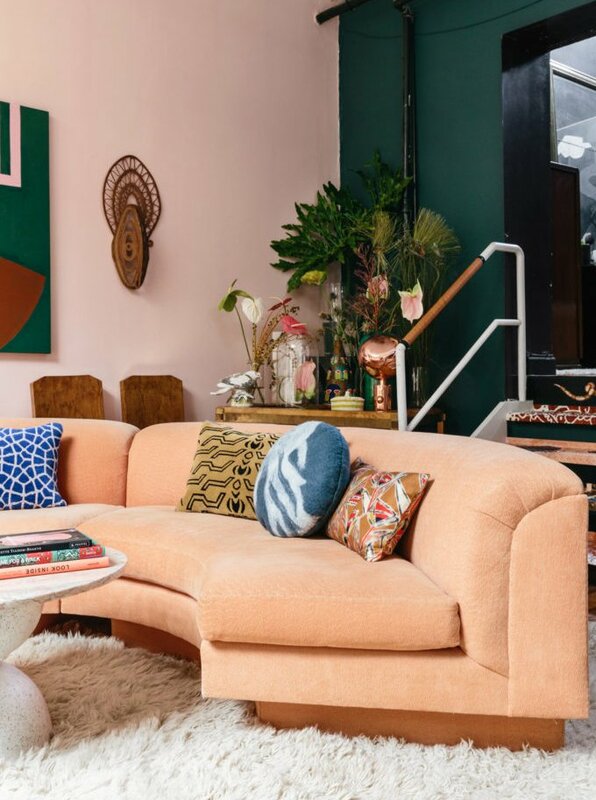 I was wondering how their mid- to late 2000s vintage bric-a-brac maximalism has fared in the era of millennial pink. I used to religiously follow hollisterhhovey.blogspot.com and your own back in the day, good to return back to see all of you doing good! I could totally imagine watching Outlander on that couch. I think Claire and Jamie would approve. I adore them. I adore their apt. I adore all those colors and the way they’ve put them together but most of all I adore their names. E erything about this and then is just so damn cool. I love these sisters. They are confident, amusing and a bit eccentric. Their space is awesome and inspired. I’m an artist and I really feel the same way that they do about making art. Who cares, just play around! 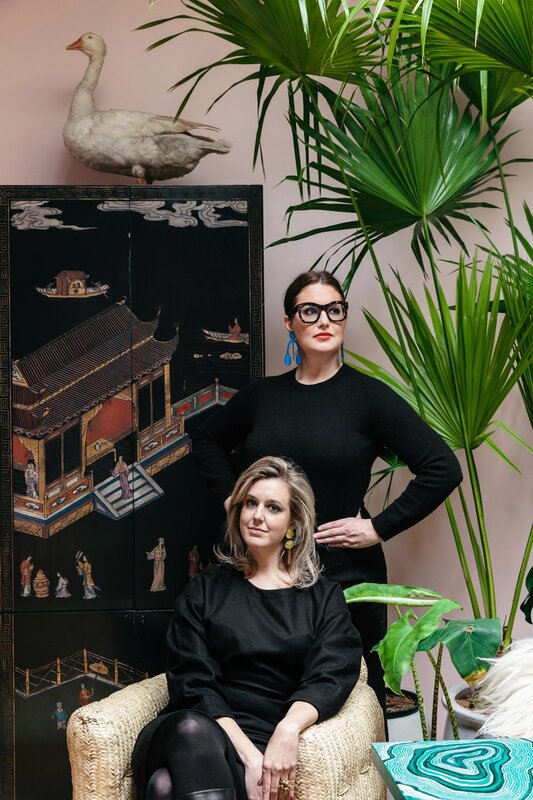 Wow, love these women, their apartment, and their work! What an adorable life.. from afar it seems like they could be the stars of some kind of Mad Men series set in modern day. One of my favourite apartment tours! Can you ask them to share more about steaming Ikea sofas? We have a sectional from Ikea that I like quite a bit, but maybe I’d love it if I steamed it? How does one do that? And why? I am so stinkin’ impressed with Hollister’s artwork. I love abstract expressionist art and basically spend all my gallery time drinking it in (much to the chagrin of my friends who “don’t get abstract stuff”), and her paintings are flat-out fabulous. LOVE the home, decoration, unique pieces (birds!!! ), too. 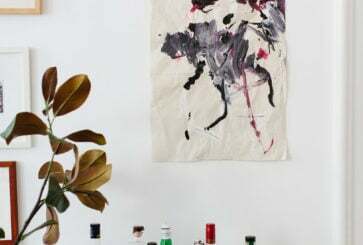 A common thread I find with stylists and designers is this idea that art is not worth paying for – that it is fine to copy someone’s work or buy a cheap knock off. In fact it is a frequent thread on this blog, and until now I have resisted the urge to comment. But it makes me extremely sad. Artists are insanely under paid, yet every charity you can imagine asks these people to donate work for an auction… if you want to hang work on a wall, I urge people to save up and pay someone who makes art. If you think it makes a home, then do the right thing. Most galleries and artists will accept slow payments, and there are many affordable options. It’s a wodnerful and excited area, and I can assure you your paintings will mean so much to you if you take the time to develop your taste and awareness. I’m sorry but I totally disagree. I am an artist. So you are saying people should not try to make art themselves? That is the very definition of being an artist – anyone is free to make art if they want to try. She never said to straight up copy someone’s work. I wish there was a “like” button for your comment, Laura! I completely agree! As long as they aren’t selling rip offs of someone’s work, then I see no problem with it at all. Maximally beautiful! 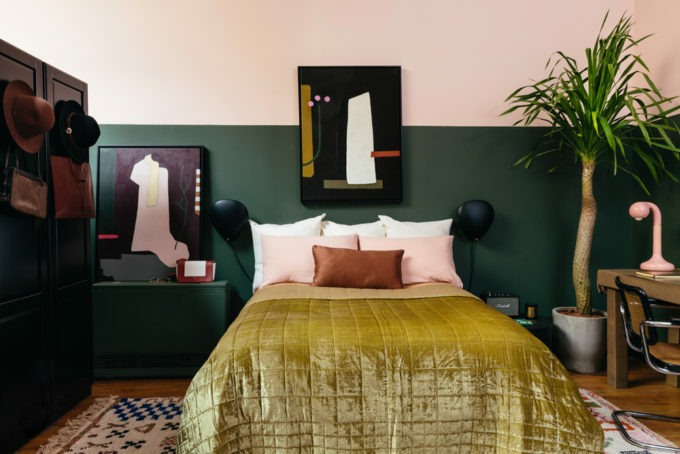 The green paint of Porter’s bedroom links to Benjamin Moore Vintage Vogue. It looks so different on BM site compared to the photos in the post. Would you be able to confirm Vintage Vogue is in fact correct? And is the green elsewhere in the apartment the same as her bedroom? Thank you! I love these two and am so happy to see such close sisters who clearly enjoy each other and what they do. It’s been fun to see them experiment with so many different design elements, and it always feels fresh and fun. such a fabulous home and such a beautiful relationship. I am (happily!) an only child and so many of the sibling relationships I see are strained or complicated, but this post really makes me long for a sister as a forever best friend. They are amazing! Came here to say that too! Follow up post needed! Every new photo I said out loud, “Are you freaking kidding me? !” Max Toth?! Those stairs?! The lamps?! Even the flour and sugar canisters are bursting with personality. This is one of my favorite tours to date. Wow. Just gorgeous. …and now I’m obsessed with pink and green! they have a projector hidden in the armoire. the project it onto the wall where the art is behind the sofa and it’s a HUGE screen! These women are incredible! Such a completely unique and awesome space! I’ll definitely be sharing this article on my blog this week! Having been in house/apartment shopping mode not long ago, I was so fascinated by staging and how it works. Like where do they keep everything they aren’t currently displaying? How often can they re-use pieces? How on EARTH can you design it and move everything in in two- three days?! Sounds like such a cool job. I LOVE THIS! The pink! The plants! The couch! The weird cabinets! I see big earrings and tortoiseshell! I had no idea this job even existed but it’s a new dream for me! This is one of my favorite home tours to date! Such a feast for the eyes. Plus they’re exactly why I yearn for sisters someday, since I don’t have any myself. I like the use of color and all the pretty things they have in their apartment. It reminds me of my house, as I have used color, family heirlooms, and collectibles throughout my house. I have never cared for white walls nor a white kitchen. Please ask Hollister and Porter to share more of their interior design and staging tricks. Steaming a sofa?? 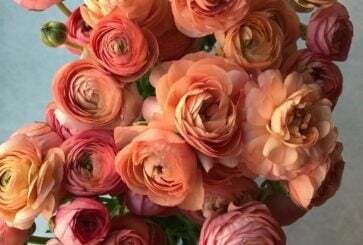 Amazing faux flowers? Insider tips for an online auction?? More, please! Thank you. Seriously, this would be a good feature! Fabulous names for fabulous women! Wow, everything about these sisters, including their personal looks and style, gives off a ‘best of the 70’s’ vibe. Well done! I wish I knew them and was friends with them. I’m around their same age and also from Kansas City. What high school did they go to? I feel like a spirit sister, because I left KC at age 19 and have lived in DC and elsewhere working in the art museum field and have always felt like life is bigger than what I knew growing up. But at the same time, the midwest holds a soft spot in my heart. Maggie – we went to Shawnee Mission East! Before East we were at Pembroke Hill! So fun!! Where are their earring from? They are fantastic! The blue earrings are from Annie Costello Brown I believe! Their array of pillows on the sofa are great, what a beautiful selection! Please cupofjo, write a post about throw pillows with links? That would be fun! Nice ones that aren’t wildly expensive are surprisingly hard to find. 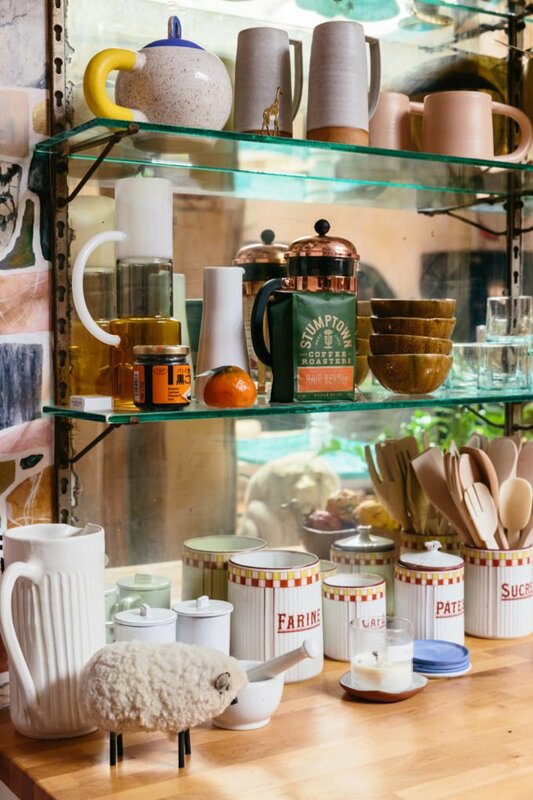 I also tend to mix original, vintage pieces with Ikea in my home – I would love to know what their go-to Ikea pieces are! Awww, I have 2 girls and I can only hope they grow up to be as fierce and fearless and dedicated to each other as these ladies! Great apartment. This post literally just convinced me to have another baby in the hopes that my daughter will have a baby sister and they will end up this cool and this close. They are GOALS. This made me smile so much!!! I also live with my sister and immediately sent her this (…though she had, of course, already read it since we COJ is the often the best part of both our days; in fact, her boyfriend ALSO reads COJ now so he knows what article/story/topic we’re referring to when we get home!). Having a sister, being close to her, and living with her is the most wonderful, magical experience!!! I loved this one! I’d actually love to see a floor plan of this apartment! Also, I just read (for the third time) siblings without rivalry and I’m just fascinated to hear more about your relationship together. As a sister myself and the mom to a set of close in age boy-girl siblings, I’m currently obsessed with sibling relationships. Yours seems so beautiful–I’d love it if Cup of Jo could interview you more about it and you could share tips with the rest of us (both for helping our own children develop strong sibling relationships and for us grownup siblings too)! Second this! I’m pregnant with my second girl and they will be 17 months apart (!!!) I’m worrying about competition between them already. I know sibling relationships and introducing a new baby is some COJ has touched on, but I’d love to see it tackled in a more in depth way. writing more about sibling relationships is such a great idea! i’d love to do more of this. thank you for the feedback. Fun post! I bookmarked the online auction site, and am going to remember the tip about sending out the cast of characters before the party. Stunning tour! As an aside, any chance we can find out where Hollister got those blue earrings? Would LOVE some sources for faux plants! My dog goes after real ones, but I miss having cheery orchids or bouquets on the coffee table! Dream home. Take me in… I wanna be the third sister! Totally in love with this tour. I have been pondering pink walls in my living room for about a year, and I think this tour makes me want to pull the trigger on it. I love everything about this home, but especially all the original artwork! Making my own art for my home is something I have been trying to work on lately myself. cool I just pinned every single picture and am still drooling over my keyboard. these girls are the COOLEST. wow. Loved it. What a way to start the day, spicy sisters, wouldn’t have it any other way. Looks lovely and unique. I don’t agree with the comments about the apartment looking dark or cavelike at all. You can see the light pouring in from the skylight in the livingroom. *Jawdrop* These girls are amazing! What a fabulous tour. They are JUST SO COOL AND LOVELY! Their Mum must be so proud and she sounded like a wonderful lady. That sofa is a game-changer! It seems like the ultimate place to hang out and socialise. Making a mental note to find a similar style of sofa in future. Ladies, I am sure your Mom is around and SO SO SO PROUD AND HAPPY for the two of you!!!! Just waking up and listening to the news today made me miserable, but that beautiful table has turned things around. I am not a fan of bandying about the phrase life-affirming, but this post is. Thanks. They are SO cool. How can I follow them on instagram please? I grew up with Hollister and Porter, but was in Hollister’s class. Their mom was sooo creative and as a result, Hollister had THE COOLEST birthday parties. That’s what I remember. It is super fun to see them on Cup of Jo because I have followed you for awhile! Love the post – thanks for sharing. HHH and Porter – well done and continued success to you both. Wow I love these sisters’ names. Hollister, how cool is that? I love their styles, too. Those black vintage wardrobes are gorgeous! I love the quote about framing linen! I framed a piece of wrapping paper because I thought it was beautiful and it tied into my mini gallery wall. I’m also obsessed with the pink walls! I remember Porter and Hollister from elementary school in KC – I remember thinking how cool and stylish they were, even as a 2nd grader! So great to see their grown-up style, too. Man, looking at their apartment made me so jealous of being able to live with your sister. I think my younger sister would be the perfect roommate and now that I’m married with two kids I get sad sometimes thinking that we’ll never live together again. These two and their place are the cats pajamas! 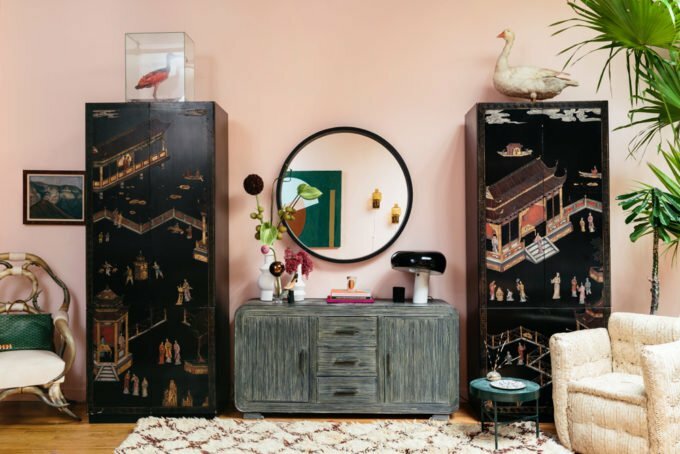 Loved seeing their unique styling and instantly makes me want to add weirder elements to my décor…it is such a visual pop to see these crazy items they have corralled in their home. I’m hoping they pop up again on this blog. Oh my gosh, this is OFF TOPIC, but can we possibly please source those amazing dark glasses in the last photo?!? So beautiful, and such a great frame for her face! Absolute dream apartment. 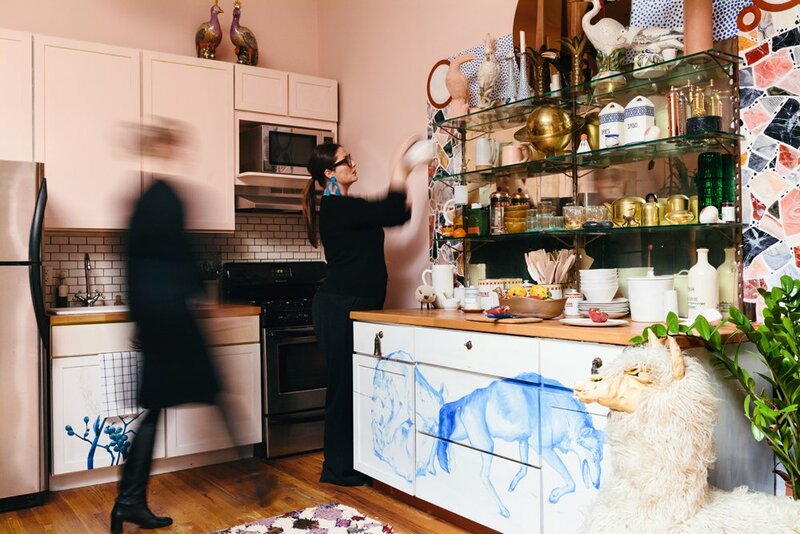 Everything – from the DIY paintings to the incredible lounge and light fixtures. Absolute perfection! Is it just me or should someone write a novel about these ladies? (If there is a novel, please let me know!) They are simply amazing. All the color is swoon worthy and what unique and interesting style. I’d like to just walk around their place and look at stuff. I also love the idea that black walls makes everything else look like a dutch painting. I adore the aesthetic of those dark dutch floral arrangements. I couldn’t go with black in my apartment because it doesn’t fit the style of the building but I love that somewhere some great sisters have and are. I totally remember a previous home tour, either on here or on Design*Sponge, of their home when it had the black walls, and it was so different! That must have been almost 10 years ago! I love their evolution; taste and style is so fluid. Who knows what their home will look like in 5 or 10 years?! Will be lovely, no matter what. totally! it has looked so different throughout the years. in my 20s, alex and i would go to big parties at their place, when it was all black with tons of taxidermy and, once, a bluegrass band! I was thinking about the Design*Sponge tour too—black walls and taxidermy—it was the aughts defined, styled, and maximized. I love how the apartment has changed and evolved. 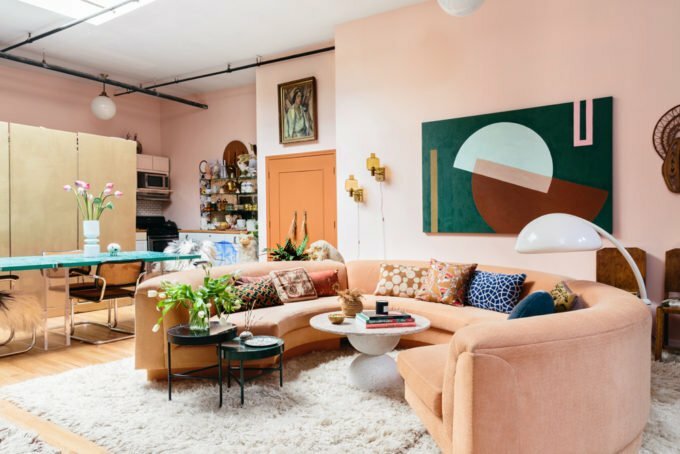 I usually think interior design speaks to itself (and to Pinterest and “trends”), but this apartment speaks to the moment, this is a this wave feminism, the future is female, the power of sisterhood space. And I love it! I looooove this so much. 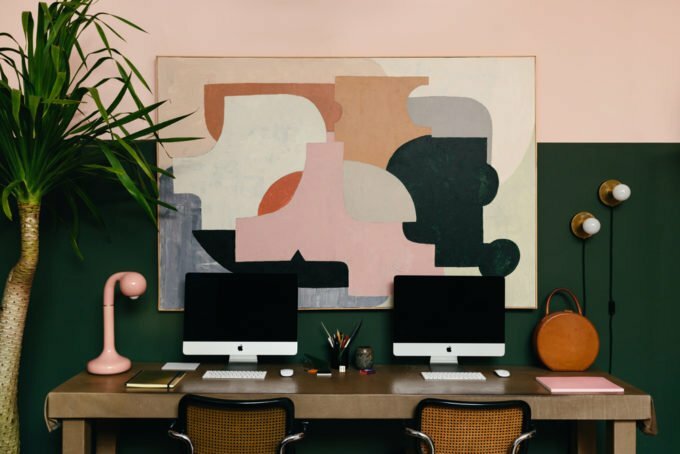 After years and years of blogs featuring homes that are essentially the same (white walls, subway tiles, a few quirky personalized touches here and there but so few with truly their own style) this is refreshing and delightful. Love that couch and the paintings. 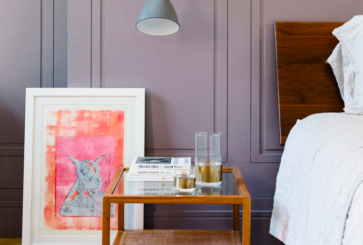 It feels inspiring to see a space that is really and truly indicative of someone’s personal taste and style. Yes! I really love the maximalist homes. It’s so funny how identical the white-paint-with-a-gallery-wall apartments start to look. I named my daughter Hollister (she’s 2) and I love that the only other Hollister I’ve ever heard of is such a fiercely independent and wildly inspiring woman. (And my son’s middle name is Porter!) Crazy! These are two amazingly creative women! Can’t wait to see more from them in the future. wow, that is so wonderful! I’ve seen multiple apartment tours of theirs throughout the years and love it’s always so different! Nice to see what they’re up to! That dining table! My jaw is on the floor to think that they MADE it. Love this place! 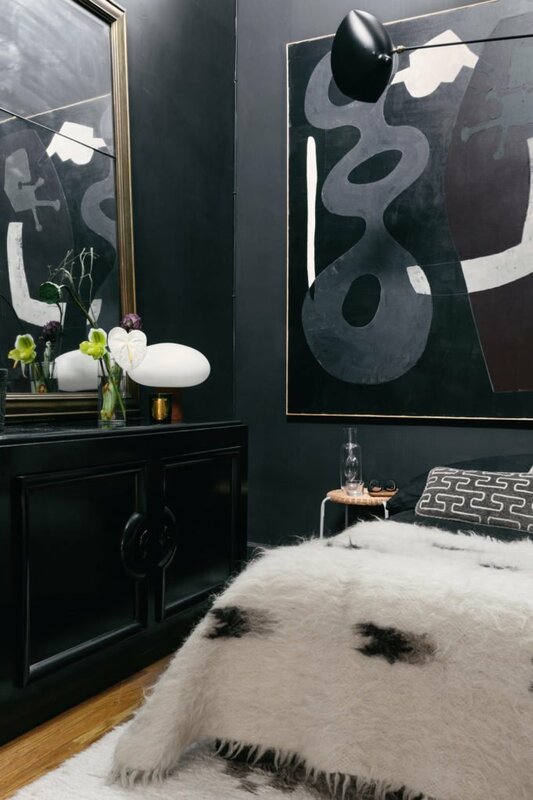 I want more pics of the elevated black bedroom…. Obsessed! I love their home so much! So unique and stunning. I’m curious… are there any windows in this apartment? It seems so dark! good q! there is a big skylight in the living room, and a window at the very top of hollister’s bedroom wall. her bedroom has 15′ ceilings, so they bought a ladder to climb up and open it for fresh air in the summer! Hollister and Porter! I remember you from the blogosphere back when! I even voted for Porter to be on Mad Men. Ha! So interesting to see how your aesthetics have evolved. I suspect we have similar background (I could be wrong), and I feel as though an American story gets told by the shift from tartan to blush+peach. This reminds me of Caroline’s post about cool people really being people that are authentic. This apartment is just so obviously them! This is such a refreshing Home feature! I have finally embraced my maximalist-ism after years of trying to be minimalist and failing miserably. Every furniture piece in their apartment looks so unique. I also loveee the color blocking in the bedroom. Thanks for sharing!! I’d love to see more like this. I don’t think I’ve ever loved and admired an aesthetic on such a visceral level as much as this one. I can’t even figure out what to call it. No matter: it’s just so clever and chic (like the pair of you, it seems). It looks like the set of a show I want to binge watch. Love this advice: “… send out an email beforehand about the cast of characters. You only need to put one sentence — this woman is a cartoonist, this guy loves bocce. 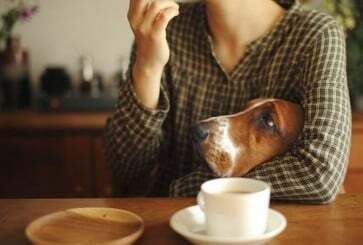 That way, everyone comes in knowing everybody else.” That is excellent for those of us with anxiety who can’t figure out how to get a conversation started. Love the home as well! This place is absolutely incredible. I love everything about it! You go Hollister!!!!! I love seeing you pop up on this site! Are there no windows in this home? Am I missing something? I can’t be the only one who noticed this! I was wondering the same thing! I hope it’s less cave-like in reality. Also, that LiveAuctioneers site is already a new obsession. It’s amazing! Omg, my sister and I would kill each other within a week. But we’d at least agree on design choices, I guess! This place is stunning. The combination of that pink and that green is mesmerizing. This does make me wish I had a sister! I love these ladies! I remember seeing a post of their apartment a long time ago with the black walls and tons of taxidermy that was stunning. The updated look is just as gorgeous! 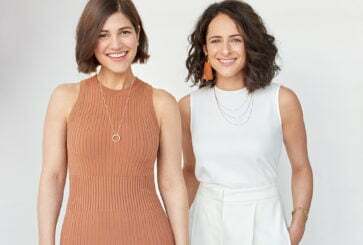 They are such an inspiration to be your most authentic self! I have a twin sister and I will always be disappointed that we never got to room together after we moved away from home for college. We went to different colleges, and now we’re both 24 and married, so we don’t stand a chance. There are things about her that drive me crazy (she never wakes up to her alarm, I turned it off the entire time we were in high school and sharing a room) but having her by my side always makes me feel invincible, like my comfort blanket. If we had lived together, there is no way that our place would look like this! Hollister, Porter — I’m 24 and just starting out decor-wise, but I just bought a vintage pink velvet settee for seventy-five bucks on Craigslist and I feel like you’d be proud. I’ve loved every CoJ post about you guys. You make me wish I had a sister. Thank you for being so original! I’ve wanted to see more from Hollister since her beauty uniform, my all-time fave. 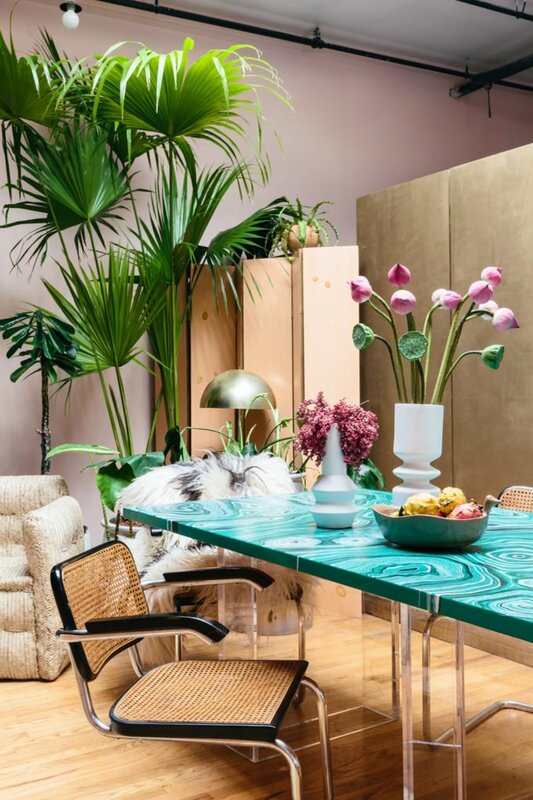 All of the amazing furniture and artwork in this place–that dining table!– is unreal. And those earrings! oh i’m glad you said this, i was just going to request beauty uniforms for them! ha! Yes, such a fun beauty uniform. I was hoping Hollister might have an update here on her search for the perfect apricot perfume! I love these sisters and that you posted this on “siblings day”! 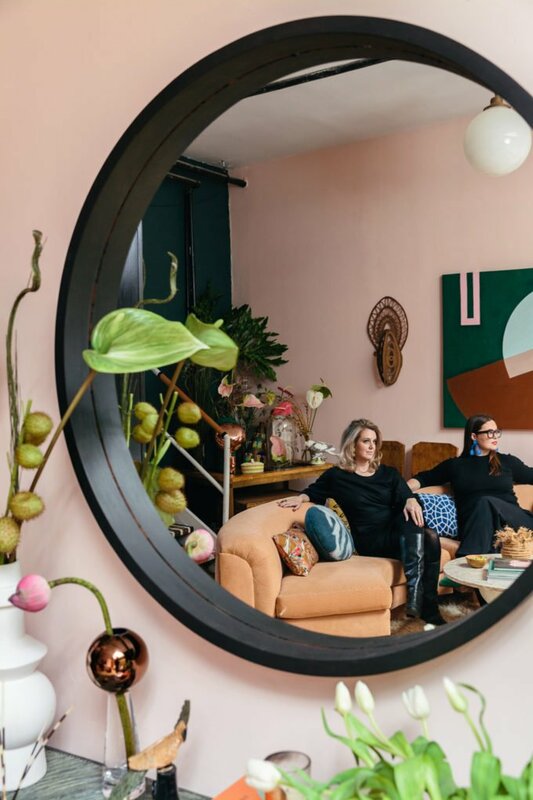 Their style is SO fun and beautiful and what a dream job/apartment/life!!! My mom always told my sisters to “be nice to each other because when you grow up you will be best friends and you won’t want to remember all the mean things you did to each other”. I love seeing other siblings who are bffs! YES!!!!!!!! 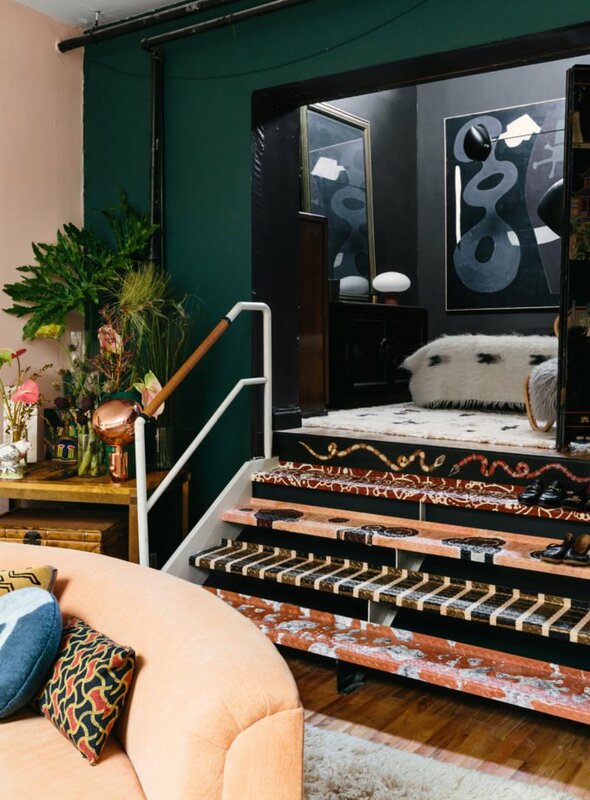 I’m also a maximalist and love color and pattern and texture and collections and layers and trinkets and plants! The all-white minimal trend of the last few years kind of bums me out, but this just made me so happy and gave me a burst of energy! This is so unique and personal, what a treat to get to live here. Totally agree – yes to color and pattern and texture and collections and layers and trinkets and plants!